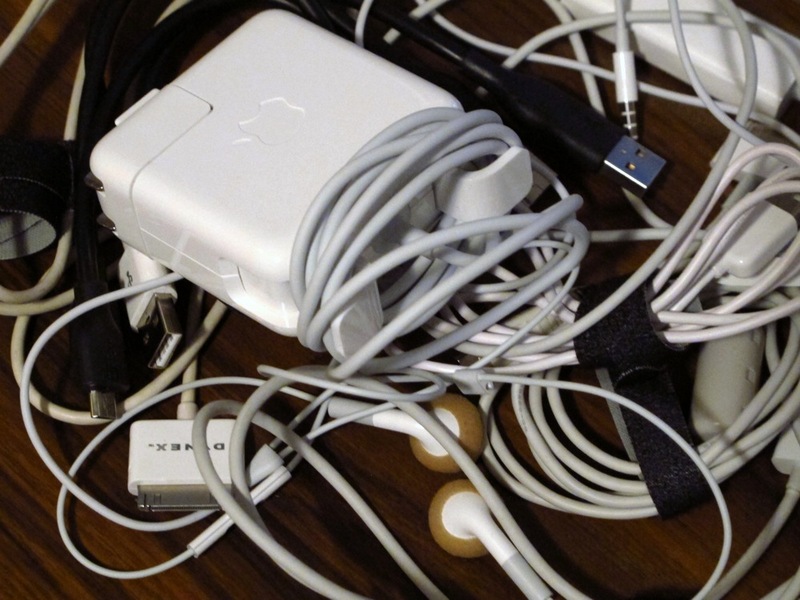 Organizing Series: How to organize your cords and cables | Save. Spend. Splurge. I use two methods to organize my cords and cables. The first method is the simplest. Just go and pick up some velcro strips at any hardware store (e.g. 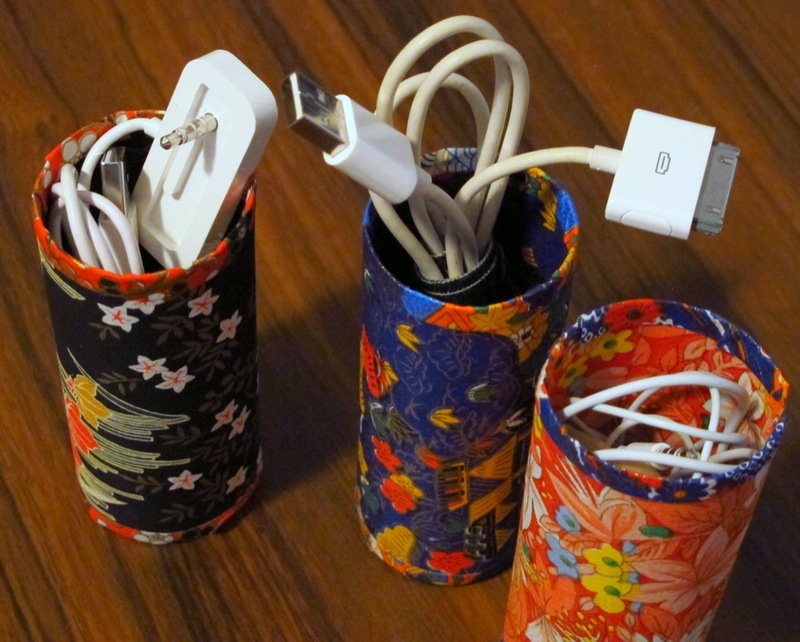 Canadian Tire, Home Depot or Rona), and use them to wrap your cords. I use this method when I am traveling or carrying the cords, and I only have a few I need to take. Headphones are the worst. Their thin wires tangle so easily, no matter what trick you use. 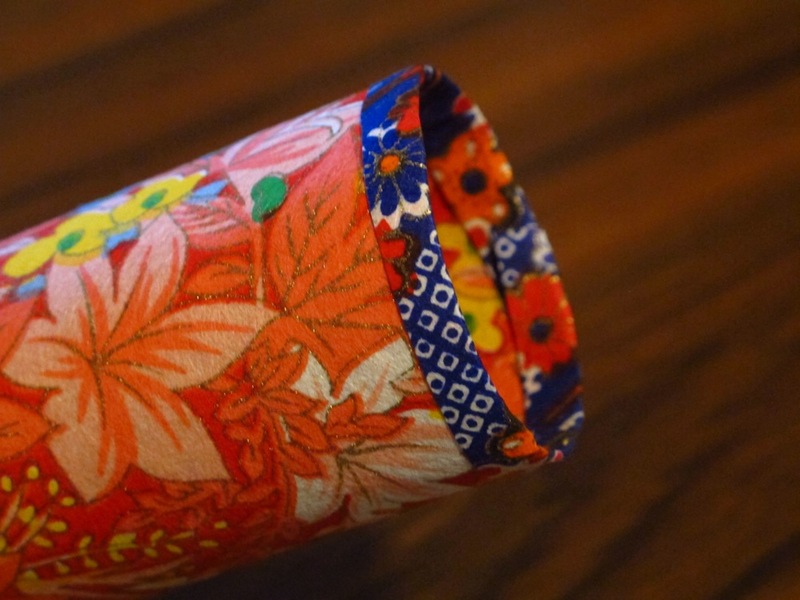 So, you can do what I did, and put them into nice do-it-yourself recycled toilet paper rolls, beautified! 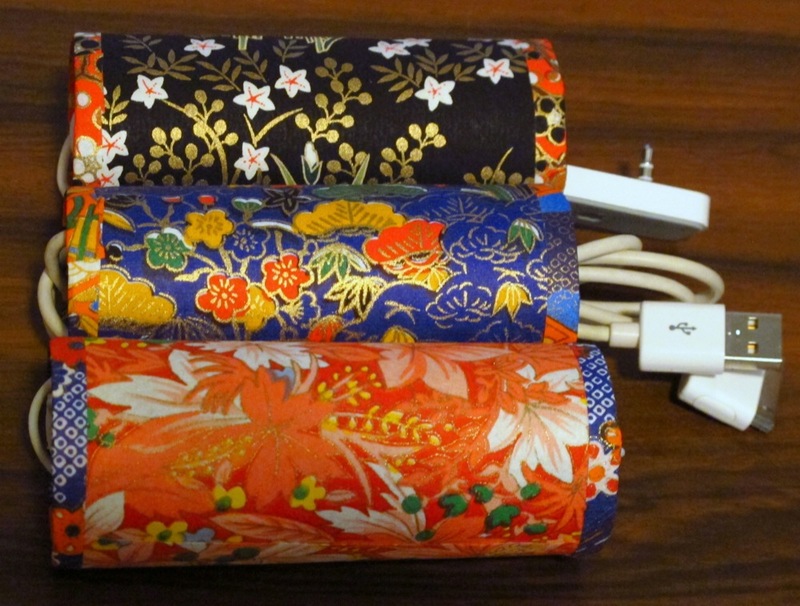 You also won’t need to velcro-strip them, you can just wrap the velcro strip around the cord to have it for when you travel, and leave the cords loose for ease-of-use. Now being who I am (a bit OCD, obsessed with pretty things, full of free time… take your pick), I thought it was kind of boring and ugly, so I decided to make them pretty with some nice Japanese washi paper we had lying around instead. 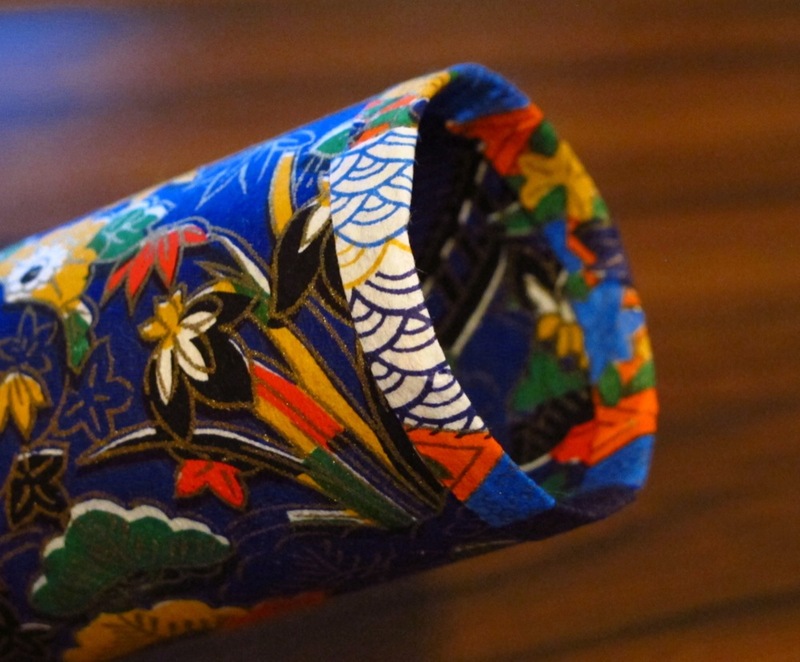 Washi paper is perfect for this, because it is kind of like a woven fabric which soaks up the glue nicely and is quite pliable; the patterns are so colourful and pretty, it will hide a range of minute mistakes, such as the folds you make. Other thicker, stiffer papers won’t be as easy to use for rounded corners. And this is all you need to do it. Each toilet paper roll I used (Charmin) is about 4″ high and 6″ as the length (width) to roll around once the toilet paper roll. After I finished, I thought it looked a little wonky, because my scissor-skills are crap, and it looks unfinished to me. I don’t like leaving projects done badly, so I HAD to do a finishing strip. This is easily remedied with a small strip of paper and finishing the edges. 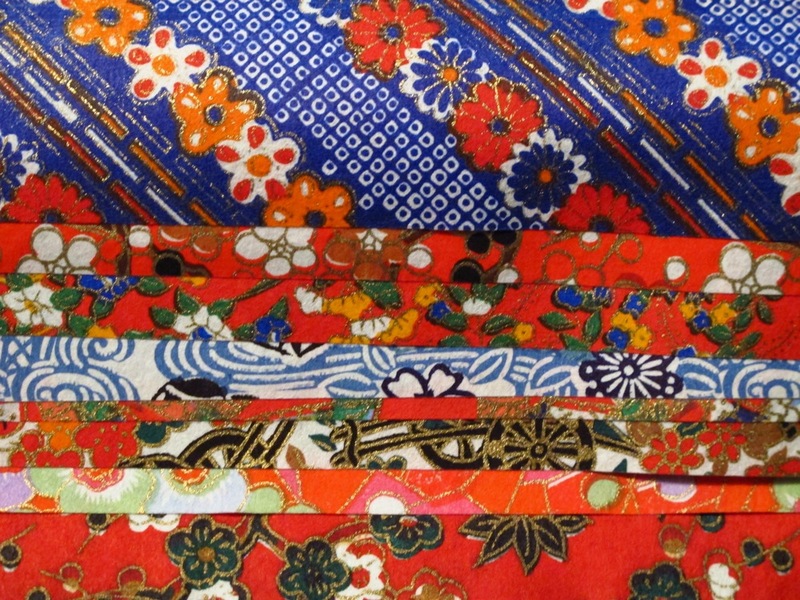 The two strips I cut out, are about 1″ in width, and 6″ in length (same length as the roll to wrap it). I cut out 2″ in width x 6″ in length, so I could split THAT in half, and cover both ends, by folding each strip in half, applying some glue to all the edges on some old paper, and then wrapping it around the edge in a dumpling-pinching motion. 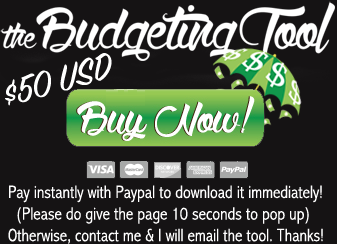 Here’s what they should look like each: 1″ x 6″ in total, then folded in half so it’s easier to pinch it around the edge.. In total, the whole thing from start to finish, takes me about 10 – 15 minutes to do, each, once you have the method and measurements down. The trickiest part is applying the glue to every corner, but as I mentioned, I use an old piece of scrap paper as the bottom, lay the washi pieces of paper flat, and use the glue stick to get every corner. 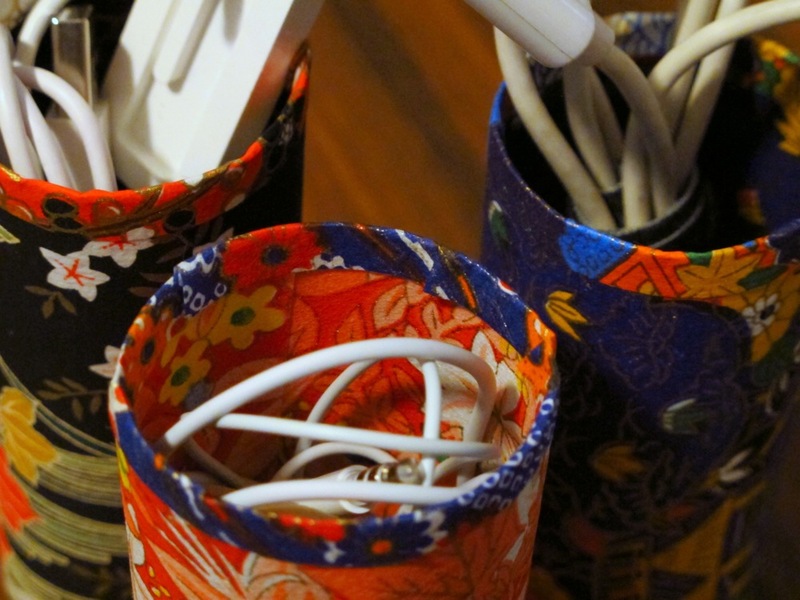 Lastly, you can use these to organize smaller cords and things as well. Not just cords or cables for electronics. Here are the 3 I finished in their completed glory! Now to do as many as possible! Update: So I made 6 more for a total of 9. You can leave them lying down for a prettier effect (which takes up more space), or stand them up in a box. It’s very easy to see which cord is what, if you make sure to put the identifying head of the cable at the top. Know what else they’re really great for? Taming your cords. This is my laptop cable. It’s super long (even with the short cable that they give you), and it drives me MAD that it looks like a tangled serpent’s nest behind my laptop. …then I just pull the connector (far right of this second picture) to charge my laptop when I need to. How do you organize your cables and cords? Is it one of those wrap around things? Like a bobbin? LOVE!! 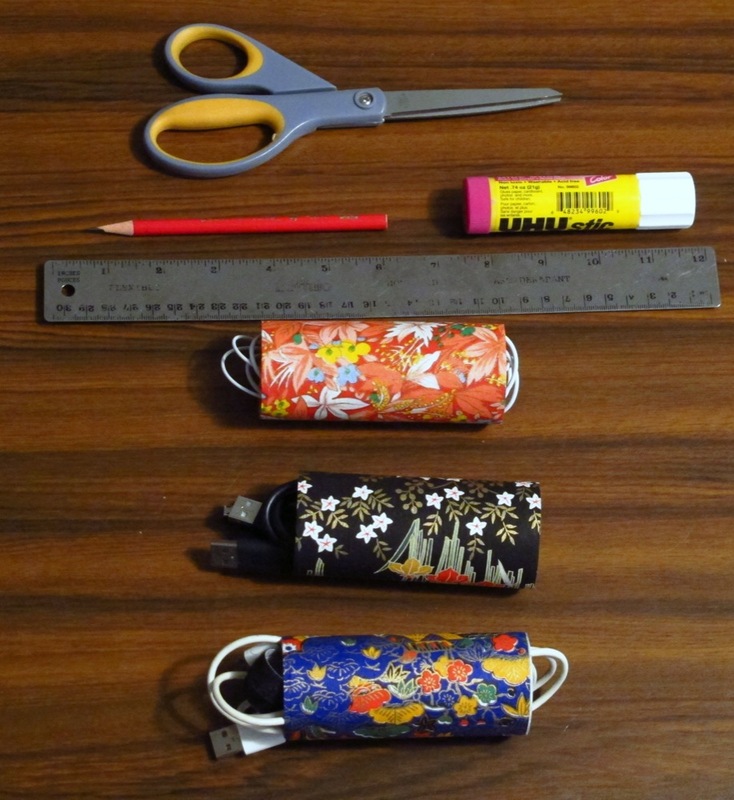 I’m a fan of washi paper and always have a bunch on hand, this is a great reuse idea. I have a neoprene bag at home made by Built that I keep little used cords in. It was made for that purpose, has divider pockets, etc. I used to use it when I traveled for business Internationally for my laptop/phone/converters but now it pretty much stays home. 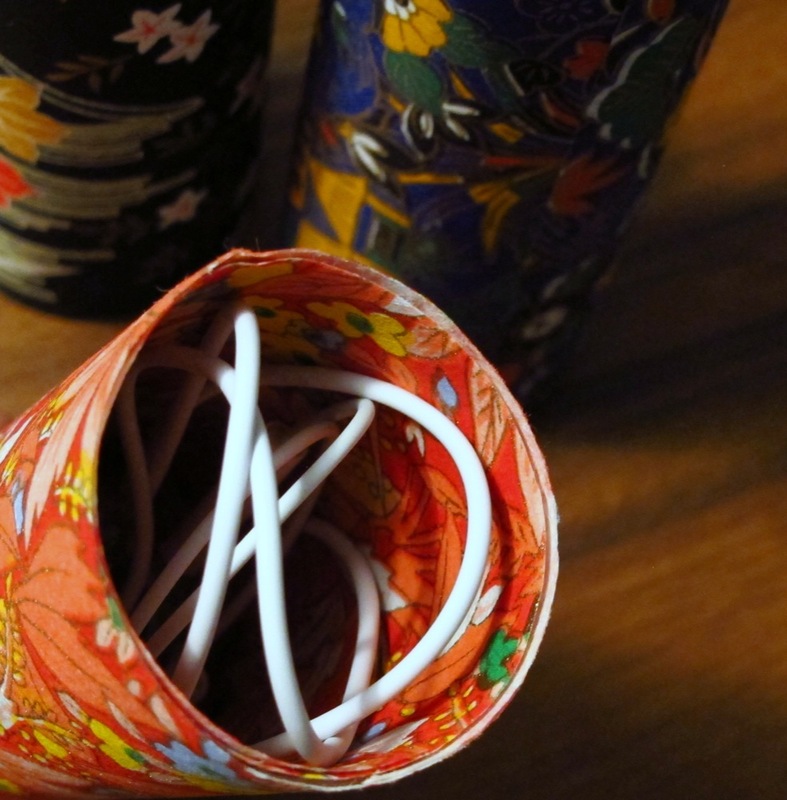 Your TP idea will work great for cords I leave out and use on a regular basis. For my purse, I buy a pouch bigger than I’ll need for my mobile device. For example, I carry an iPad mini with me daily. The keyboard clicks onto it by magnet so the screen is protected. Then I throw the mini into a pouch made for a regular size iPad. By using an iPad or bigger pouch, I can then throw in my headphones, mobile cables, wifi, stylus etc into the pouch as well. So, when I change bag, nothing gets left behind. In the pouch I use these silicone cord clip things made by Blue Lounge to hold them but it doesn’t work that well honestly. The “figure 8” method works the best for winding cords at any rate but for your TP idea, you don’t even need to do that. I’m too lazy to wind cords, hence why I came up with the TP idea. I love this !!! I’m not sure where I can get this type of paper here in Phoenix but I will check into it. I know, maybe i’ll ask at an awesome Japanese restaurant ( Hana ) that i haven’t ate at in a while. Maybe they will know. You can find it online too. Lots of paper shops sell that paper online or just looking for a stationery shop will help. I was thinking (as I walked and read) that with all the measurements, one piece might be bigger, so it could overlap into the inside of the tubes. I think that’s what I’d do, cause I’m so OCD about matchy!! I had very few cables pre moving in with the BF. When we consolidated, I got all my cable twist ties (stored from everything I bought in the last 18 months – random stuff comes with them! ), and I tied them all up. Laid them all out for him to see – and set up the TV etc. The rest are now in a tray/drawer under my TV. I use a bobble for my earphones, but I don’t really carry them around (the bliss of the work car situation!) – so earphone live at work, and in the buffet drawer for gym usage (next to never now). I must get into running WITH music, but my phone’s earphones are weird when you’re moving. Sorry, I got distracted with that little tale!! I like hearing how people organize their cables, I find I learn a lot more and can pick up new things, so feel free to ramble! Yes, you could certainly match on the inside as well and I thought about it, but as you put the cables in, it tends to drag out the paper, and I didn’t want the paper to stain the cable or to ruin the inside and lift up the paper.